We had a great time sponsoring Bingo night last night. 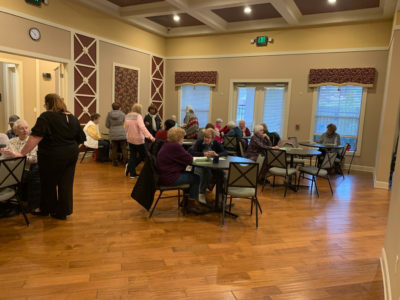 We met 30+ residents of this beautiful active senior community and we had 2 double winners! (two people get bingo at the exact same time). I haven’t played bingo in a long time and was surprised at home many different Bingo games there are. Lots of fun and a great chance to meet some new people. If you or an aging loved-one are considering Home Care Services in Johns Creek GA, please contact the caring staff. Email: info@realmccoyhc.com • Phone 404-536-1060. The Real McCoy Home Care is your locally owned and managed in-home, non-medical home care agency. Serving North Metro Atlanta. ← Who Should Be Involved in Family Meetings?